Iron is an essential nutrient for plants, animals and also for humans. It is needed for a diverse range of metabolic processes, for example, for photosynthesis and for respiration. If a person is lacking iron, this leads to a major negative impact on health. Millions of people around the globe suffer from iron deficiency each year. Iron enters the human food chain through plants, either directly or indirectly. Although there are large quantities of iron in the soil in principle, plants may become iron-deficient because of the specific composition of the soil. Additionally, a plant's iron requirements vary throughout its development depending on external circumstances. The Münster-based plant biologists working with Prof. Kudla from the Institute of Plant Biology and Biotechnology are specialised in understanding what is referred to as 'cellular signal transduction', in particular calcium signal transduction. 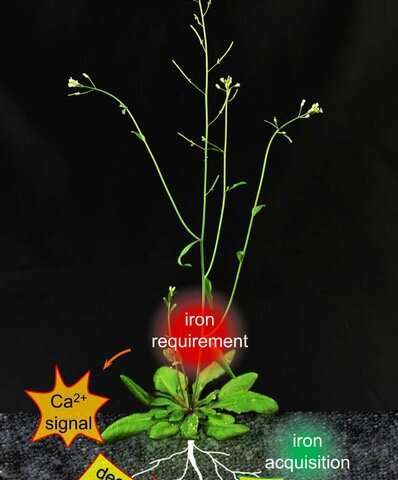 This involves a signal transmission whereby the plant converts and passes on information about the environment and triggers stress responses for example—or, as demonstrated in the present case, a better response to iron deficiency. To this end, the team at the WWU Institute of Inorganic and Analytical Chemistry headed up by Prof. Karst analysed the iron concentration in the plants.